Direct immunofluorescence (DIF) is routinely performed according to methods first outlined in detail by Beutner et al. (Beutner et al. 1965). The technique detects deposits of the immunoglobulins IgG, IgA, and IgM as well as of the complement components C1q, C4, and C3 at the DEJ of biopsy specimens taken from lesional or unaffected skin of patients with LE. Results are most reliable in snap-frozen skin biopsy samples. The sensitivity of the method may slightly decrease when fresh tissue, immersed in a suitable transport medium such as Michel's solution, is first mailed to a reference laboratory before being processed for DIF. Since the relative intensity of fluorescence may vary in different biopsy sites and to a great extent depends on the duration and past treatment of a lesion, a standardized protocol is needed to ensure an optimal outcome and comparability of results for diagnostic and research purposes. If possible, facial lesions should not be biopsied since chronically sun-exposed facial skin often shows false-positive DIF results. 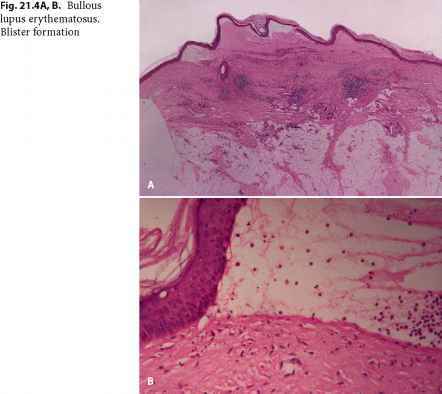 It is known that the frequency and intensity of a positive LBT result increases with the age of a lesion; therefore, LE lesions should be older than 4 weeks before biopsy - a prerequisite often impossible to meet in SCLE or SLE - and should be left either untreated or spared from previous treatment (e. g., with topical corticosteroids) for longer than 3-4 weeks before biopsy (Dahl 1983).